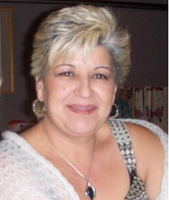 Provide comfort for the family of Francesca Gioia with a meaningful gesture of sympathy. Peacefully surrounded by the love of her family, at ARCH on Wednesday February 6, 2019. Frances was set free. Beloved wife of the late Silvio Gioia. Mother of Kassey Richardson (Kevin) and Sonny Gioia (Maryann). Grandma of Davion and Janiah Richardson. Daughter of Rosina and the late Carmen Grandinetti. Sister of Max Grandinetti (Darlene), late Mario Grandinetti and Rosa Grandinetti. Daughter-in-law of the late Gaetano and Rosina Gioia. Sister-in-law of late Santo Gioia (Maria), late Cesare Gioia (Louise), late Ada Gardi (late Frank) and Maria Policicchio (late Gino). Frances will be missed by her nieces and nephews. She loved to bake, cook, crochet and take the occasional trip to the casino with mom. Special thanks go to Dr's Spadafora, Bowen, Smith, Reich, Bruni, Booth, the staff of Bayshore, the Sault Area Hospital Cancer Clinic and ARCH for the care given to Frances. As per Frances’ wishes, no visitation or services will be held. In lieu of flowers memorial contributions to Tracy's Dream, Sault Area Hospital or ARCH would be greatly appreciated. To send flowers in memory of Francesca Gioia (Grandinetti), please visit our Heartfelt Sympathies Store. Provide comfort for the family of Francesca Gioia (Grandinetti) by sending flowers.